Kosher wines do not have to be expensive. Though there are many pricey bottles out there, you can find an equal number of affordable kosher wines for less than $20. 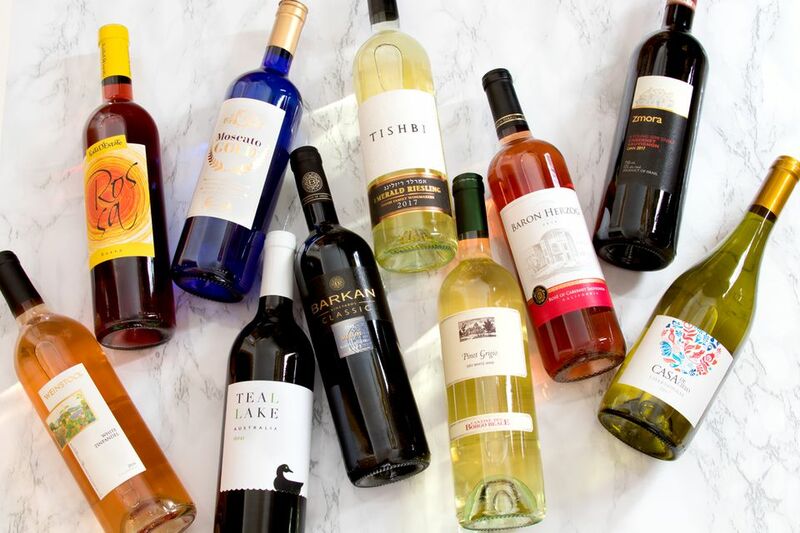 Whether you enjoy a full-flavored red or a bright and airy white, you and your wallet will be delighted with these wine picks that are perfect for any occasion or season. All of the featured bottles are kosher for Passover and meshuval (meaning "cooked"). Today's practice of making meshuval wine does not actually involve boiling the wine, as it once did. Instead, the winemakers use flash pasteurization, which, as you will find in these top-rated bottles, in no way ruins a wine. Rather, it opens the wine up to be made and served by anyone—whether they are Jewish or not—while retaining adherence to the traditional laws. Depending on where you live, it can be tricky to find a variety of kosher wines locally. Fortunately, there are a few online wine merchants who specialize in them and can ship wine straight to your home. Two that offer an impressive selection and great customer service are KosherWine.com and Jwines Kosher Wine Store. A nice Cabernet Sauvignon, Zmora is produced in Israel by Ben Ami Wines. It's soft and inviting, with a delicate sweetness marked by flavors of berries and cherries. This can quickly become your go-to table wine. It's fantastic with entrées like beef brisket and classic veal wiener schnitzel, as well as roast poultry. Savvy red wine-drinkers know that some inexpensive Merlots can be disappointing. This is not the case with Barkan Classic Merlot. From Israel's esteemed Barkan Winery, this bottle offers everything that makes red wine enjoyable: dark cherry and plum flavors, accented with pleasant cinnamon spice. Serve it with a flavorful chicken dish, and your dinner is sure to be unforgettable. Crisp, clean, and a fantastic dinner companion, Chardonnay is one of the most versatile white wines. A fine kosher option is Casa De Cielo Chardonnay. This Chilean wine features a lovely array of tropical and stone fruits, from pineapple to apricot, and is a pleasure to drink with seafood dishes like poached fish in pepper sauce. Australia's Teal Lake produces a Shiraz that is spectacularly intense and elegant. This red has long been a favorite among kosher wines. You'll love the play of flavors as the softer berries and cherries are accented with subtle spice. Such a well-balanced wine makes a pleasant accompaniment to grilled foods like Hawaiian ribeye steaks and lemon-herb chicken and veggie kebabs. Bright and absolutely beautiful, Tishbi Vineyards Emerald Riesling is a stunning wine you will definitely want to seek out. It's as fine as any German Riesling, and holds the same delicious floral and fruit notes that make this white style spectacular. While this one will be excellent with any food, we recommend following the vintner's suggestions of pairing with appetizers, cheese, and salad. For dessert, open a bottle of this sweet Contessa Annalisa Moscato Gold. This sparkling Moscato is made in Italy using traditional methods. It is beyond delightful, offering an orange blossom aroma and sweet citrus and peach flavors. The bright taste is ideal for lemon poppy seed hamantaschen or, for a high holiday dinner table, a sweet honey applesauce cake. It's really hard to ignore this bottle! The vividly colored label is just as fun as the bright ruby-colored wine within. Festa D'Estate Rossa is a sweet, lively sparkling Italian wine. It's especially delicious served well-chilled alongside sweet desserts like Israeli cheesecake or decadent hors d'oeuvres like herbed goat cheese and apricot babka. A beautiful rosé wine, Baron Herzog Rosé of Cabernet Sauvignon is vibrantly sweet and exhibits refined qualities that are understated by its price. Made entirely of California Cabernet Sauvignon grapes, this wine features refreshing strawberry flavors without being overly sweet. This crisp, refreshing aspect makes it a joy to drink with food. Served chilled with grilled fish dishes and light sides, like smoky cedar plank salmon and classic Israeli salad. It's not often that you find a White Zinfandel with an off-dry profile, and that's why Weinstock White Zinfandel is so exciting. This California rosé has a subdued cotton candy nose and a bright finish that follows a hint of berry sweetness. Wine can make food more of an adventure, too! This one is fantastic with Asian-inspired flavors, particularly poultry and fish. Enjoy it with recipes like sweet-and-sour duck sauce chicken, or fresh salmon patties. Borgo Reale Pinot Grigio can easily become a favorite wine and, at this price, there's no guilt in enjoying it with a weeknight dinner. This is no ordinary Pinot Grigio: It features a surprising burst of fruits—melon, citrus, and apple—with a crisp sweetness that will please any wine-drinker. A pleasant sipper for Passover, it's fabulous alongside lemon-herb halibut and fresh quinoa salad with citrus vinaigrette.